The following two PROC SQL steps show two equivalent CASE expressions that create a character column with the strings in the THEN clause. The CASE expression in the second PROC SQL step is a shorthand method that is useful when all the comparisons are with the same column.... I am guessing that you have an ID on Import_Orders, if not use any field name that is turning up empty on the query. You would be better using field names rather than *. It does not appear that you are Joining on a table called Generator. You cannot have the table in your WHERE clause unless you JOIN on it. If you add a JOIN to Generator then you can use … how to use network detective I am guessing that you have an ID on Import_Orders, if not use any field name that is turning up empty on the query. You would be better using field names rather than *. Just an FYI if you run Get-Help Select-Sting where you see -Pattern in the description. Alternate Key Lookup Using IF statements. Problems with dynamic search conditions come in several flavours. 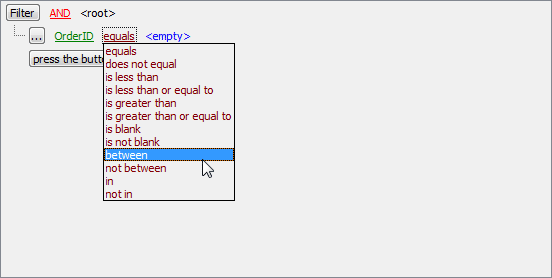 In the general case, there is a search form where the user can select between many search conditions, and this is also the main focus of this article. The example I demonstrate in this article uses the Conditional Split transformation to divide data retrieved from a table in a SQL Server database into two data flows so we can save the data into separate tables. Hi Everyone, I'm doing a stock Control System as a school Project using An Access 2007 DB and Visual Studio 2010. I'm trying to do an update Query based on two variables entered into comboboxes, I cannot get the VB to accept the conditions for this, Can anyone Help me?